broad face of tip easily passes through notch and provides a means of protecting poster capsule during guide wire drilling. Works on bone-tendon-bone and other grafts. D4Surgicals PCL tibial aimer provides a mean of protecting posterior capsule during guide wire drilling. D4Surgicals PCL femoral aimer helps in accurate guide work placement. The hoop tip provides a visual reference for the diameter of the fully reamed tunnel helping avoid tunnel encroachment on the articulated surface. for use of cruciate reconstruction when using hamstring or patellar tendon grafts. The screws have blunt threads which protect the grafts from laceration.The round head screws reduces the stress in the graft as it exits the femoral. All probes are autoclavable. The probes which are used for underwater cutting and coagulation can be attached to standard uni-polar electrical cautery machine. Ball electrode for underwater cutting and coagulation. 900 electrode probe for lateral release underwater cutting and coagulation. A variety of cannula systems with double valve, rotateable, blunt, conical, sharp teeth etc. obturators are available. We offer orthopedic fixation and implants like ACL PCL fixator, surgical obturator, knee ortho implant, conical tip, probes, patellar tendon grafts and other implants for ACL reconstructive and arthroscopy surgery. 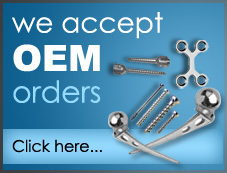 We are manufacturer, supplier and exporter of such orthopedic implants from India.